Just for fun, I decided to try a new sweet treat that I came across on Pinterest. Homemade snickers bars. They were incredible and tasted almost exactly like the real thing!! 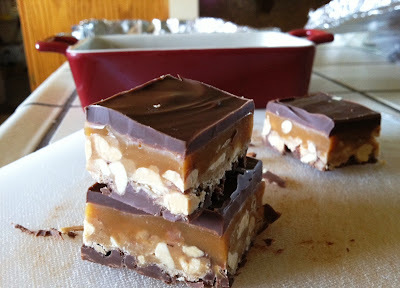 This recipe makes an entire tray of snickers bars so of course, I brought them into work and they were gone instantly. Recipe from How Sweet It Is found from Pinterest. Thoroughly grease your baking pan. Melt ingredients together in a saucepan and spread until even. Let cool and harden completely. Melt butter in a saucepan over medium heat. Add in sugar and milk, stirring until dissolved and bring to a boil. Let cook for 5 minutes, stirring occasionally. Add in fluff, peanut butter and vanilla, stirring until smooth. 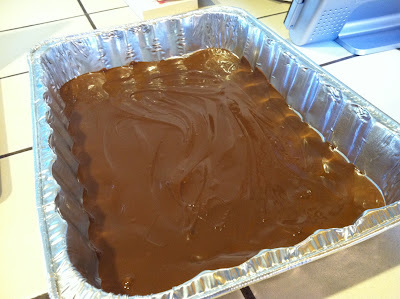 Turn off heat and fold in peanuts, then pour over bottom layer of chocolate. Let cool completely. Combine ingredients in a saucepan over low heat. Let melt, stirring occasionally, until smooth, about 10 minutes. Pour over nougat layer and let cool completely. Melt ingredients together in a saucepan, then pour over caramel and spread until even. Let cool and harden completely. Refrigerate for at least one hour before serving, then cut as desired. These can stay at room temperature, but they do get gooey. Refrigerated is best! For best results, use one of the aluminum cake pans at the grocery store that way you can pop out the entire rectangle and cut.